It’s been a long time since I watched a race I wasn’t running, so the BUPA London 10k was an ideal opportunity to go and soak up some atmosphere and patchy sunshine. 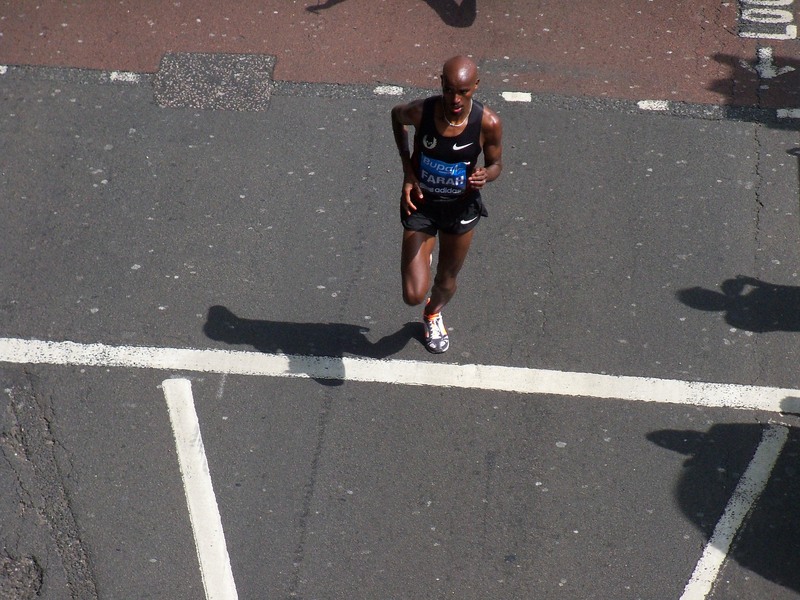 The race itself covers some of the same iconic ground as the Virgin London Marathon (and the 2012 Olympic Marathon), with runners cutting eastwards up Embankment at first before looping back round and running westwards down Embankment. Given this, Embankment seemed a pretty good place from which to spectate. There’s something slightly strange about watching a race that starts in waves – there were around 12,000 runners taking part, starting in nine staggered waves. 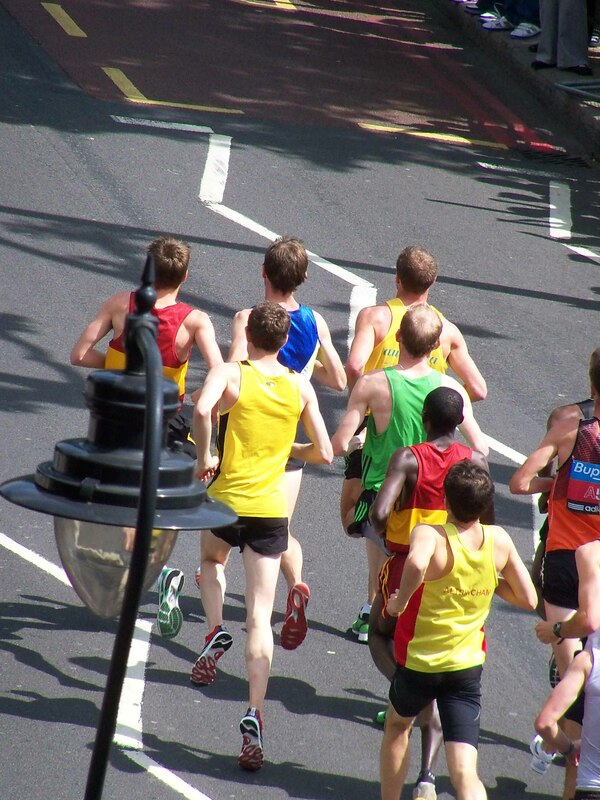 The faster club runners surge through in a small pack, followed by a gap, then the swell of other runners come through, followed by a tail end of walkers. And then the same thing happens again. And again. Standing on the pedestrian bridge from Embankment to South Bank, I had a pretty good vantage point to see how the race was progressing. The frontrunners came through the 1500m point in around 4:10 (according to the timing vehicle) and densely packed. Not the greatest shot, but you can just see Mo Farah's shoulder in the right-hand side of the picture. At Embankment, around 1500m into the race (and just before the final kilometre of the race), a throng of supporters and a samba band offered cheers and encouragement to the runners. Given some of the tweets from other spectators, though, I suspect some other areas of the course were a little quieter. Which is surprising, given the calibre of UK runners taking part. There were some calls of ‘Come on Paula’ as Paula Radcliffe (who had a disappointing return to racing after injury), but few seemed to recognise the cream of the British racing crop. However, come the Olympics, I suspect our best runners will develop a similar iconic status to Paula. Storming through in the lead-up to the final kilometer and on his way to winning the race in 29:15, Mo Farah has certainly got to be one of our best medal hopes. Mo Farah putting in a convincing performance. Anyone else excited to see what he can do at the Olympics? When I was in my teenage years British athletics was going through a Renaissance, you had Linford Christey, Colin Jackson, John Regis, Sally Gunnel, Steve Backley and Roger Black – all relatively well known and all regularly winning medals. Now, with Mo Farah, Andrew Limoncello and Jessica Ennis, we might be on the cusp of putting British athletics back into the spotlight. However, it’s not helped by the fact that events such as the BUPA London 10k don’t receive national media coverage. It’s hardly going to inspire the same kind of support as Haile Gebrselassie receives in Ethiopia. Of course, the battle for podium positions is only one of the many stories that goes into a race. Thousands of runners raised money for charity, many sought personal bests, others were running the distance for the first time. Either way, there’s something undeniably inspirational and energising about the atmosphere of a race, and spectating just made me look forward even more to the next time I toe the start line. 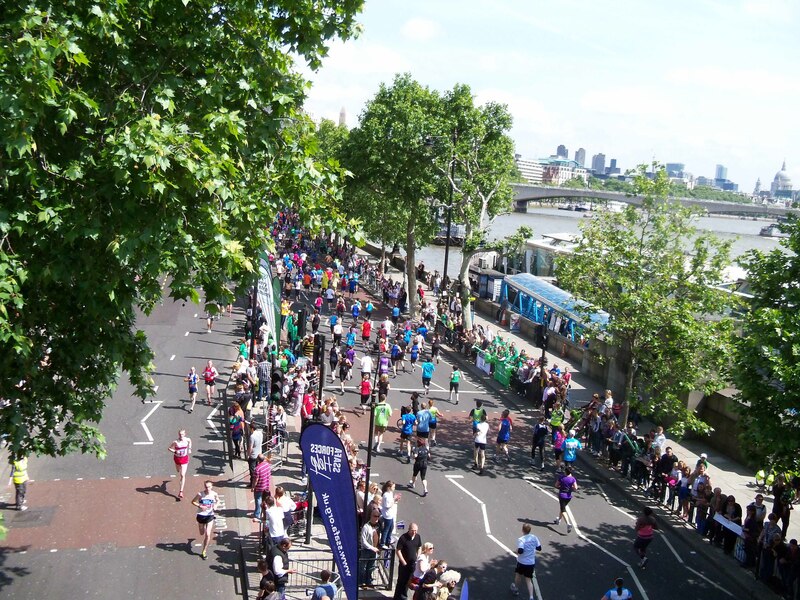 The iconic London skyline and BUPA 10k runners, cheered on from the sidelines.